Are you thinking of starting your business? Do you have an idea 💡 or dream of starting your business? Readi-Set Go! A Simple Guide To Establishing A Successful Small Business movement will takeover Book Warehouse of Ellenton!! 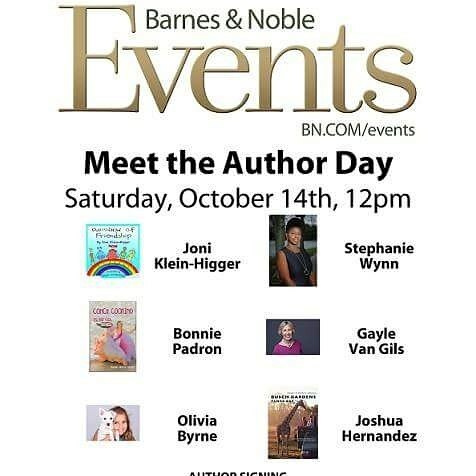 Come out and meet local author Stephanie A. Wynn!! LOCAL AUTHOR STEPHANIE A.WYNN- BOOK SIGNING! 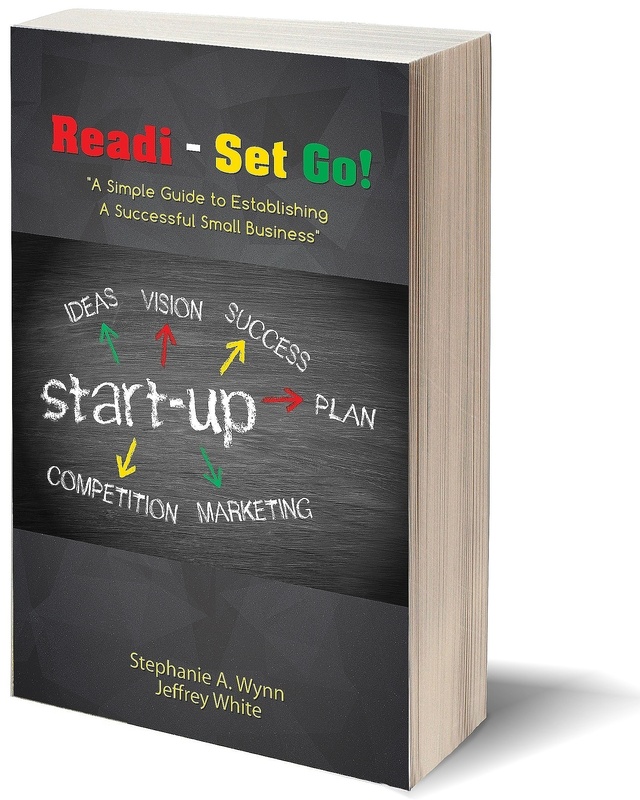 Meet Stephanie A. Wynn author of Readi-Set Go! A Simple Guide To Establishing A Successful Small Business co-authored with Jeffrey White & Tara Richter of @richterpublishing. IT’S TIME TO START YOUR BUSINESS TODAY!! LOCAL AUTHOR STEPHANIE A.WYNN OF READI-SET GO! A SIMPLE GUIDE TO ESTABLISHING A SUCCESSFUL SMALL BUSINESS CO-AUTHORED WITH Jeffrey White WILL BE AT BARNES AND NOBLE SOUTH TAMPA ON SATURDAY OCTOBER 14TH FROM 12PM-2PM, 213 N DALE MABRY HWY TAMPA, FL 33609. IF YOU ARE UNABLE TO ATTEND AND WOULD LIKE TO PURCHASE A COPY OF THE BOOK PLEASE VISIT MY WEBSITE STEPHANIEAWYNN.COM. TAG, SHARE, AND INVITE YOUR FRIENDS AND FAMILY! 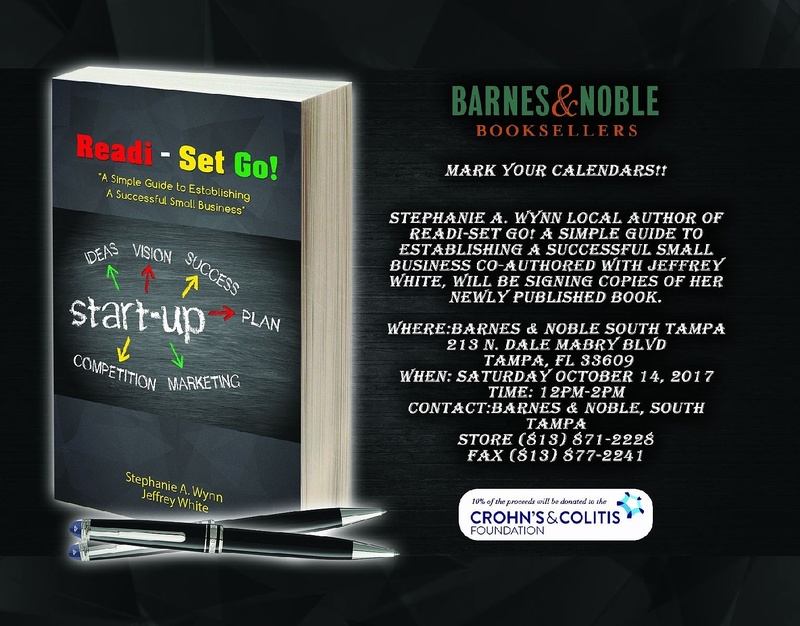 COME OUT AND MEET LOCAL AUTHOR STEPHANIE A.WYNN OF READI-SET GO A SIMPLE GUIDE TO ESTABLISHING A SUCCESSFUL SMALL BUSINESS CO-AUTHORED WITH JEFFREY WHITE WILL BE AT BARNES AND NOBLE SOUTH TAMPA ON SATURDAY OCTOBER 14TH FROM 12PM-2PM. 213 N DALE MABRY HWY TAMPA FL 33609. ​WHAT ARE YOUR 2017 4TH QUARTER BUSINESS GOALS? HAVE YOU ACCOMPLISHED YOUR BUSINESS GOALS FOR 2017? NEED HELP WITH GOAL SETTING? FOR MORE TIPS ON GOAL SETTING AND ESTABLISHING YOUR BUSINESS. COME OUT AND MEET LOCAL AUTHOR STEPHANIE A.WYNN OF READI-SET GO! A SIMPLE GUIDE TO ESTABLISHING A SUCCESSFUL SMALL BUSINESS CO-AUTHORED WITH Jeffrey White ON SATURDAY OCTOBER 14TH FROM 12PM-2PM BARNES AND NOBLE SOUTH TAMPA 213 N DALE MABRY HWY TAMPA FL 33609. WHAT ARE YOUR BUSINESS SHORT-TERM GOALS? WHAT ARE YOUR BUSINESS LONG TERM GOALS? 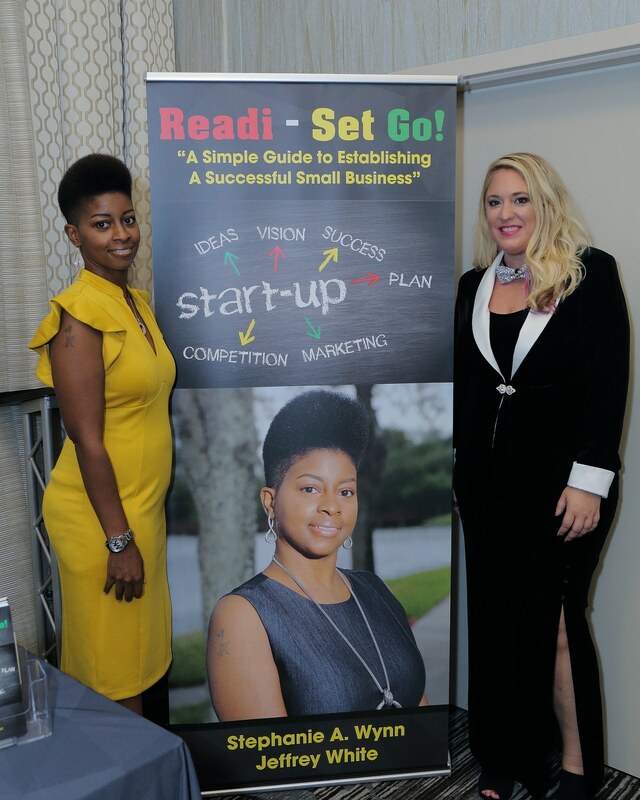 IF YOU WOULD LIKE MORE TIPS ON STARTING YOUR BUSINESS OR RE-BRANDING YOUR BUSINESS, COMEOUT AND MEET LOCAL AUTHOR STEPHANIE A.WYNN OF READI-SET GO! A SIMPLE GUIDE TO ESTABLISHING A SUCCESSFUL SMALL BUSINESS CO-AUTHORED WITH Jeffrey White. 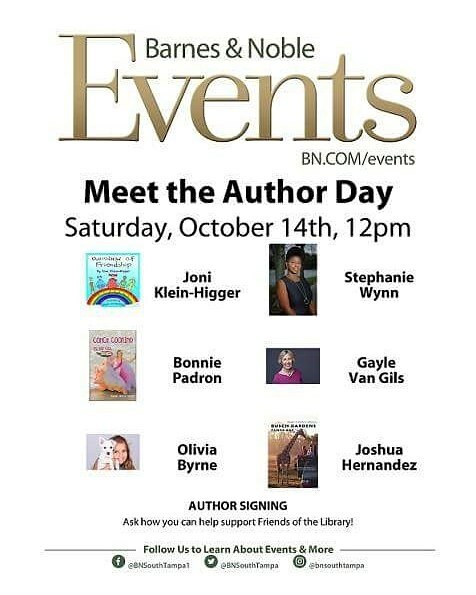 SATURDAY OCTOBER 14TH FROM 12PM-2PM BARNES AND NOBLE- SOUTH TAMPA 213 N DALE MABRY HWY TAMPA FL 33609. IF YOU ARE UNABLE TO ATTEND AND WOULD LIKE TO PURCHASE A COPY OF THE BOOK PLEASE VISIT MY WEBSITE STEPHANIEAWYNN.COM OR EMAIL ME AT INFO@STEPHANIEAWYNN.COM. ARE YOU PROFESSIONAL WITHIN YOUR BUSINESS? HOW ARE YOU TREATING YOUR CLIENTS/CUSTOMERS? DO YOU FOLLOW UP WITH YOUR CLIENTS/CUSTOMERS AFTER YOU HAVE PROVIDED YOUR SERVICES? FOR MORE TIPS ON STARTING YOUR BUSINESS. 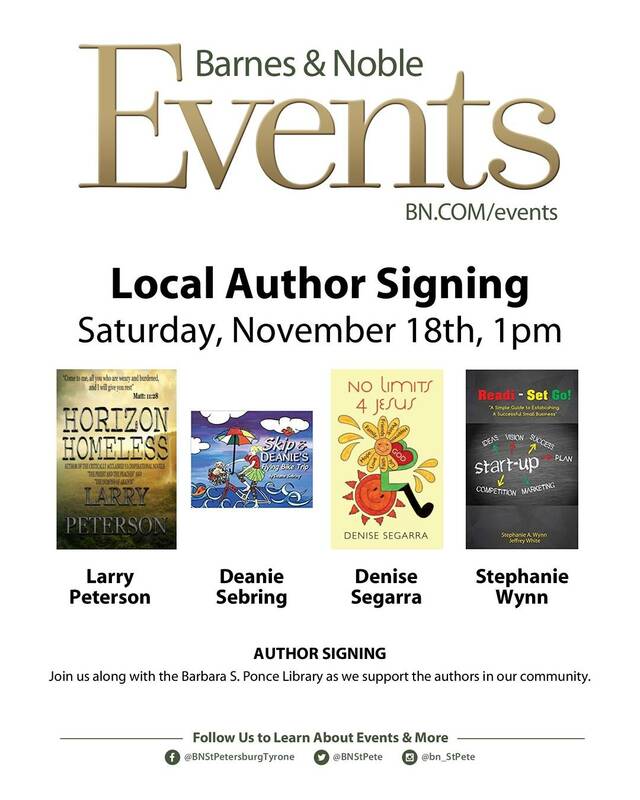 COME OUT AND MEET LOCAL AUTHOR STEPHANIEA.WYNN OF READI-SET GO! A SIMPLE GUIDE TO ESTABLISHING A SUCCESSFUL SMALL BUSINESS CO-AUTHORED WITH Jeffrey White SATURDAY OCTOBER 14TH AT BARNES AND NOBLE SOUTH TAMPA 213 N DALE MABRY HWY TAMPA FL 33609 FROM 12PM-2PM. PERCEPTION IS KEY TO STARTING YOUR BUSINESS! DO YOU RESPECT YOUR CLIENTS/CUSTOMERS? DO YOU TAKE YOUR CLIENTS/CUSTOMERS FOR GRANTED? FOR MORE TIPS ON STARTING YOUR BUSINESS. COME OUT AND MEET LOCAL AUTHOR STEPHANIE A.WYNN OF READI-SET GO! A SIMPLE GUIDE TO ESTABLISHING A SUCCESSFUL SMALL BUSINESS CO-AUTHORED WITH Jeffrey White AT BARNES AND NOBLE- SOUTH TAMPA 213 N DALE MABRY HWY TAMPA , FL 33609 SATURDAY OCTOBER 14TH FROM 12PM-2PM. Local Author Stephanie A.Wynn of Readi-Set Go! 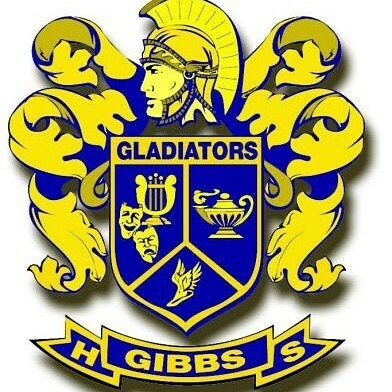 A Simple Guide To Establishing A Successful Small Business co-authored with Jeffrey White will be inspiring the students at GIBBS HIGH SCHOOL B.E.T.A Program. Educating the youth on Entrepreneurship is so important and necessary!